Woolworths Catalogue supermarket deals are not limited to the food products from grocery or deli-bakery. The latest Woolworths Catalogue covers homeware, mobile products, App Store gift cards, some smartphones, and even DVD movies like Bumblebee and How to Train Your Dragon 3. Renew the important items of the inventory of your kitchen. If you buy frypans, chopboards or similar items that are the essentials of a kitchen for cooking, I believe you can save a significant amount of what you normally pay. 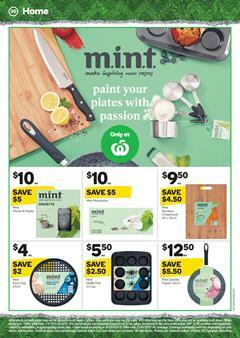 Mint Granite frypan 30cm is gonna cost only $12.50! Find smartphones like Optus X Start at half prices. Vodafone Huawei Y5 is only $109. These are simple phones with not extravagant feature specs. They can save the day when they are expected to do basic phone things. Store your foods in Sistema Klip-it storage products. Plastic storage with a very convenient mechanism of locking. Put your tomatoes in it, klip-it easily, hear the satisfying sound and place it wherever you want. These are perfect storage items when you have leftovers or some fridge food that you won't eat. Moreover, find Swisse vitamins with a 40% discount on pg 33 of the Woolworths Catalogue.